The many stages of vocal booth creation. As a novice builder, I found this gentleman's tutorial videos extremely helpful. Last year I ran into a consistently annoying problem. How do I record a VO audition/audiobook/podcast if I have to stop recording and wait for the sound of a passing plane, large truck, motorcycle, church bell, school bell, water pipes, computer fan, or friendly cricket? Solution - build a small room where no sound can enter or leave. Having never really built anything, I decided to do some research and planning to make sure that if I'm spending a good amount of money, I do it right. I scoured the internet for pictures, videos, and forum threads that dealt with the various stages of building this giant recording box. There are a few senior forum members that everyone listens to. Rod Gervais is one of those members who not only offers advice frequently, but also has a book about this very thing. If only I had bought it at the beginning of my planning and design, it would have saved me time. Many people echo this sentiment on the forums. The planning took me the better part of January and February. The building took me most of my free time in March and part of April. Home Depot and Baller Hardware sold me most of the building materials, the other stuff (like fans, window glass) I got online. Now, for the most part, it's done. There are still a few tweaks that need to be made, but when a helicopter passes overhead or a leaf-blower passes next door, I don't hear it, so I can focus on my performance. It wasn't possible without Rod Gervais' book and the help of many friends - Matthew Watterson for his viking strength and know how (and drill), Brian Nichols for his carpentry expertise, David Graziano for his sage advice and the loan of woodworking tools, and my fiance for many hearty home cooked meals. What you're looking at is this - A ventilated room with a double pane tempered/laminated 1/2'' glass window. The walls are built with staggered studs for decoupling, a 1/2'' ply outer sheath, 3'' Roxul Safe N Sound Insulation, with two layers of 5/8'' drywall on the inner wall that are separated by a layer of Green Glue. The floor is plywood on a concrete slab, with Flor carpet tiles on top (I plan to add a rubber underlay later when budget allows). The ceiling is built much like the walls, except that I used chicken wire to secure the insulation. For room treatments I built a panel resonator into the corner, and attached acoustic foam to most of the corners and wall. I'll probably continue to tweak this as I find what sounds best for recording. I built a small shelf on the panel resonator to attach my scissor arm mic stand, and a fold out table for the podcast mic. The booth comfortably seats two people, and stays cool even with temperatures of 80-90 degrees outside. The Escape Pod is now open for business. The finished product (for now). Behold y'all - The Escape Pod. Wanna kick it back and drink some tea with my buddy Andrew and me? Then listen to this podcast, wherein Andrew interviews me and we discuss a whole slew of topics. I reveal all sorts of sordid details about my life. I give shout outs to UCB, iO West, A Noise Within, Buy Me Brunch, Boston Harbor Marina, Tufts University, Owen Robinson, and panic attacks! Now you can get a dashboard glimpse of this important part of an actor's process. Or something like that. Here are two recent auditions - one for theatre, and one for online content. The first is for Pasadena Playhouse's Open Call. I was shooting for the role of Captain O'Hurley in their upcoming production of Fly, in association with Crossroads Theatre Company. The monologue is taken from The Flick by Annie Baker. The second is for a video by Freddie Wong's company RocketJump. He's a wizard of online content and if you're not familiar with him, check him out! * According to Hank Azaria. Each question is worth two points, and this quiz will be worth 100% of your grade. Anyone talking or looking at someone else's paper during the quiz gets their quiz taken away and gets zero points. When you're done you can quietly read, draw, or do homework from other classes. Headshots are usually an actor's first introduction to possible work. I've taken quite a few over the years and have looked analytically at just as many. I just took new ones to commemorate the successful conquest of my face by a majestic beard. Unless I write them on my blog. Should I write them on my blog? You're supposed to know that before coming in here! I'm trying to really lean into my inner monologues. Like a well crafted story, you can see that my thoughts come full circle (spiral?). On this journey the signposts are fake/real laughing and the destination is Natural Looksville. Population : Everyone else but me. I took them with the gentlemanliest of gentlemen - Morgan Demeter. For now enjoy this picture by makeup artist Bridget Clarke. This conceptual beard is pretty close to the real thing. Imagine this, but bigger. 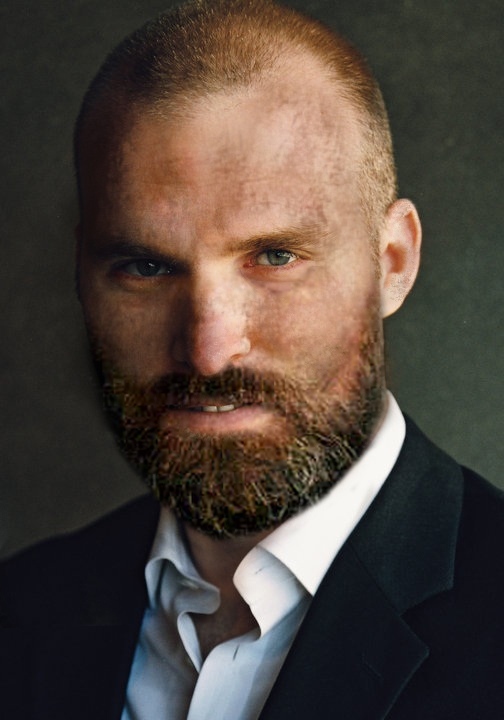 And without the dirt on my face (this was for a post-apocalyptic web series that all actors are required to create). Anyone want to remake these with me, sans the sexism and broad stereotypes? Captain Fathom? Space Angel? Can you think of better names for titular characters? I have sworn fealty to the comedy kingdom of iO West. I'm very excited to be performing on a sketch team once a month at the Del Close Theater. Our shows are every second Sunday at 7:30 pm. I am resisting the urge to say something terribly funny here because I'm saving it for the shows. I'm now repped by the Rogers Orion Agency. We talked over email about making some noise, and here's a gif he sent me. So...have your people talk to my people? By office I mean apartment, and by buzzwords I mean thoughts. Currently I'm practicing 2-3 times a week with an improv practice group. 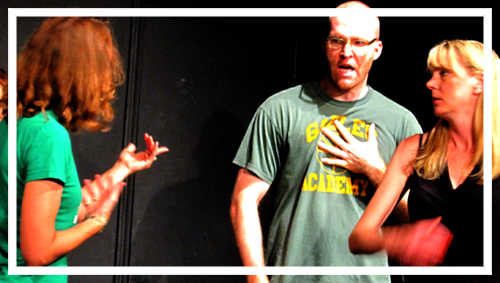 Our coaches are great improvisers currently performing at UCB - Cissy Fenwick, Jacob Reed, and Richie Root. The group is starting to gel, and I can foresee in a couple of months we'll be ready to do some awkward shows around town at some of the open improv joints. Performing for my 201 showcase at UCB.